Heat the milk in a pan until hot but not boiling. Remove from the heat. Add the butter, stir until melted. When the liquid has cooled to tepid, beat in the egg and half the orange zest. Mix the strong flour, yeast, 1/2-1 tsp salt and sugar in a large bowl. Pour in the liquid. Knead the dough for 5-10 mins until smooth and elastic. Oil a large bowl and place the dough inside and cover with oiled cling film. Leave in a warm place for about 1 hr or until the dough has doubled in size. Place the raisins and half the orange juice in a small pan and simmer gently for a few minutes. Allow to cool completely. Mix the cinnamon with 2 tbsp sugar and the remaining zest. Press the dough into a large rectangle. Scatter evenly with drained raisins and cinnamon-sugar mix. Knead well until the fruit and spices are evenly spread. Grease and line a large baking sheet. Divide the dough into 12 equal pieces. Shape each piece into a bun. Place the buns, smooth-side up, on the baking sheet. Cover loosely with oiled cling film and leave in a warm place for 30-45 mins. Preheat oven to 190C/170C fan/gas 5. Make the paste for the crosses by gradually stirring 6-7 tbsp water into the plain flour to make a smooth, thick paste. Place in an icing bag. 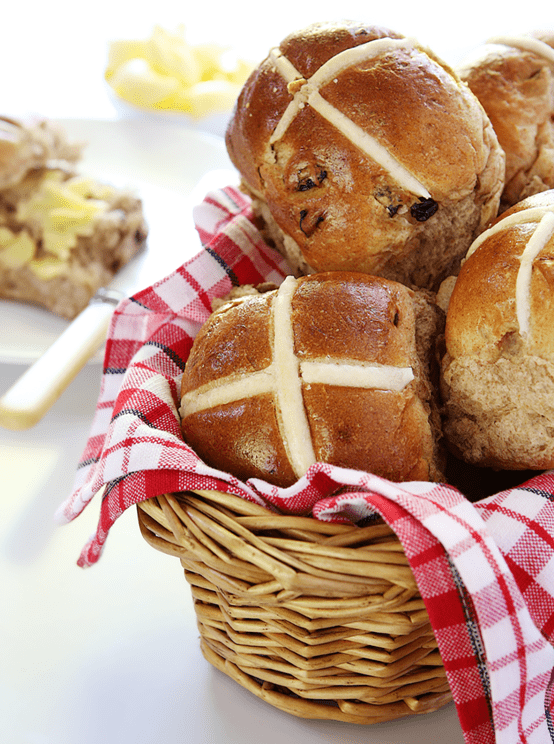 Pipe the crosses and bake for 20-25 mins until the buns are risen and dark golden brown. Mix the remaining orange juice with the remaining sugar and let it dissolve. Brush the syrup over the buns while they are still hot, then leave to cool.